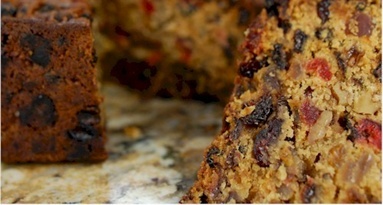 The really good chock-full-of-fruits-and-nuts kind of fruitcakes cost a fortune in shops. I love those with minimal flour but simply bursting with aged sultanas. My main gripe is that most fruitcakes sold out there are so much more flour than fruit that naming them fruitcakes is in itself a misnomer. This year, I was determined to make some at home for Christmas this year. I tried and varied this recipe several times along the way, making adjustments to the balance of ingredients as well as baking time, till I settled on what my family feels is a good enough version. This is one of the heaviest cake, in the literal sense, that I have baked thus far. More than one kilogram of ingredients have gone into the cake and I was glad I did not stinge. Each bite of the fruit cake yielded a mouthful of fruits and nuts. Truly, may it herald a year of fruitfulness in 2010! 1) Squeeze out juice of orange and finely grate the skin. Set aside in refrigerator. 2) Line and grease a 9 x 5 x 3 inch baking pan, extend about 2 inches above the pan. Preheat oven to 150oC. 3) Beat the butter and sugars until light and fluffy. Add eggs, one at a time, beating well after each addition. Scrape down the sides of the bowl as needed. 4) Add 2 tbsp of brandy and all the juice and orange and lemon zest. Fold in the ground almond and all the dried and candied fruits and raisins. In a separate bowl, whisk together the flour, salt and baking powder and fold this into the cake batter. 5) Scrape the batter into the prepared pan and bake in the preheated oven for 45 min. 6) Reduce the oven temperature to 140oC and continue to bake the cake for another 1½ hours or until a long skewer inserted into the center of the cake comes out with just a few moist crumbs. 7) Remove the cake from the oven and place on a wire rack to cool completely. With a skewer poke holes in the top surface of the cake and brush it with the remaining brandy . 8) Wrap the cake thoroughly in plastic wrap and aluminum foil and place in a cake tin or plastic bag. Brush the cake once or twice a week with brandy until ready to eat. This cake will keep several weeks or it can be frozen to keep longer.